Dave Thelen was a diverse athlete who also played semi-pro baseball. He was drafted by the Cleveland Indians of Major League Baseball (MLB) before deciding upon a Canadian professional football career. During his nine year career Thelen rushed for 8,463 yards on 1,530 carries, scoring 47 touchdowns. He was the league’s leading rusher in 1960, and the Eastern leader in 1959 and 1965. During 1960 he had eight 100-yard rushing games. His career best game was in September when he carried 33 times for 209 yards against Toronto. 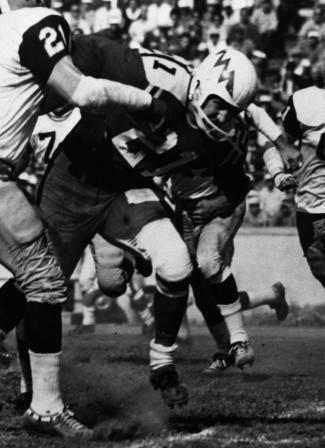 Dave Thelen rushed for more than 1,000 yards per season in 1959, 1960, and 1961, and had 30 100-yard rushing games. In 1959 he was Ottawa’s nominee for the Schenley Most Outstanding Player award.